Another month, another Short Stack! This month’s was Prosciutto di Parma, which was great because prosciutto is one of my favorite meat products and I really enjoyed learning new ways to cook with it that aren’t just “slap it in between a bagel with fresh mozzarella and call it a sandwich” (although that ‘recipe’ is really good, I promise). This is really my goal in doing this Short Stack project: I want to get enthusiastic about ingredients I don’t know anything about. This month, though, I fell back into old loves, culinary and academic. I’m working on a sourcebook for Onyx Path’s Changeling: the Lost, a tabletop roleplaying game I’ve loved since I was a teenager. Literally, I vividly remember toting the core book (and the main World of Darkness rulebook, since back then they parceled out mechanics into a separate book that you had to have to play, which was ridiculous, but anyway…) on college visits. I’d sit at a hotel desk and pull out the books and some printed character sheets and dream people up. I was 16 then; I’m 26 now. This game has been with me for a long time, and I’m so damn excited to be part of its 2nd edition — but I digress, sort of. As part of my freelance assignment, I’ve spent the last month and a half reading fairy tales and folklore from around the world, something I was really passionate about in high school and university that fell off after I started working in journalism. A lot of things fell off because of journalism. It’s very hard to switch your brain back and forth between reading and writing 500-word news articles and reading and writing fiction. It’s been lovely to revisit that, like curling up in a comfortable old blanket. 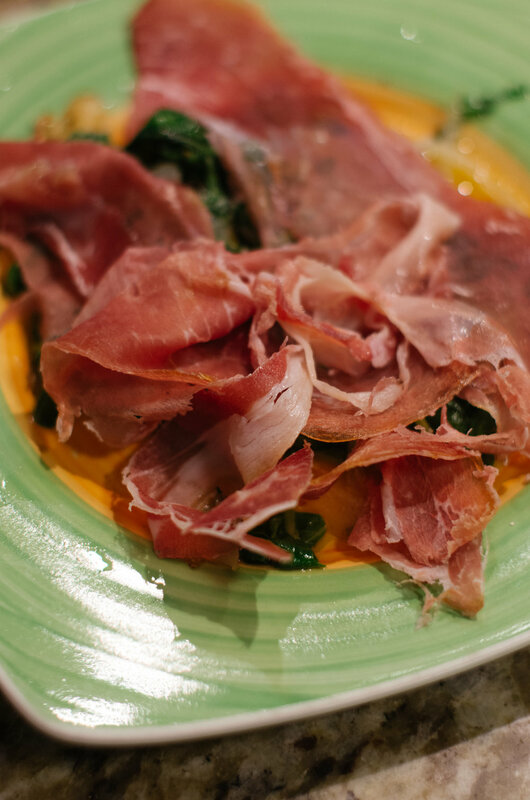 Eating prosciutto di Parma is the same way, a comfort food I’ve loved for a long time, nourishing my body like fairy tales nourish my mind. It feels fitting that this overlapped. 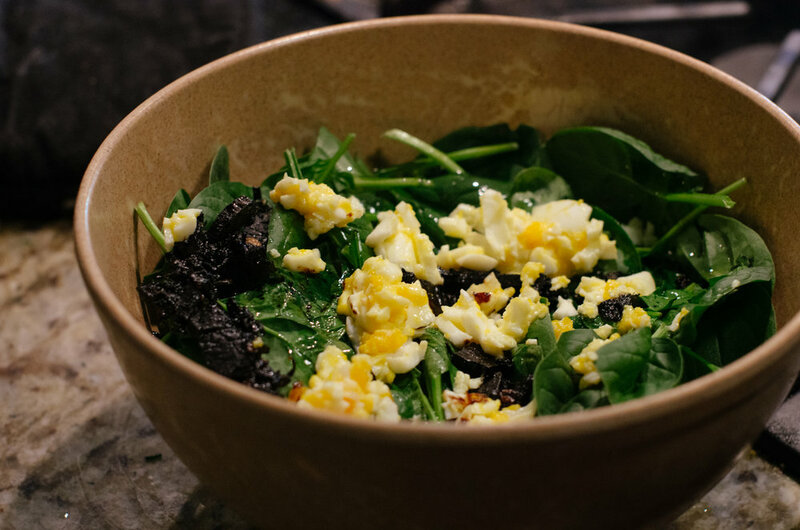 Wilted Greens with Prosciutto: I like the idea of this, but didn’t love the execution — I found it to be a bit oily and also too hot (both of which were probably my own fault, as I quartered the recipe and that sort of reduction can be hard). 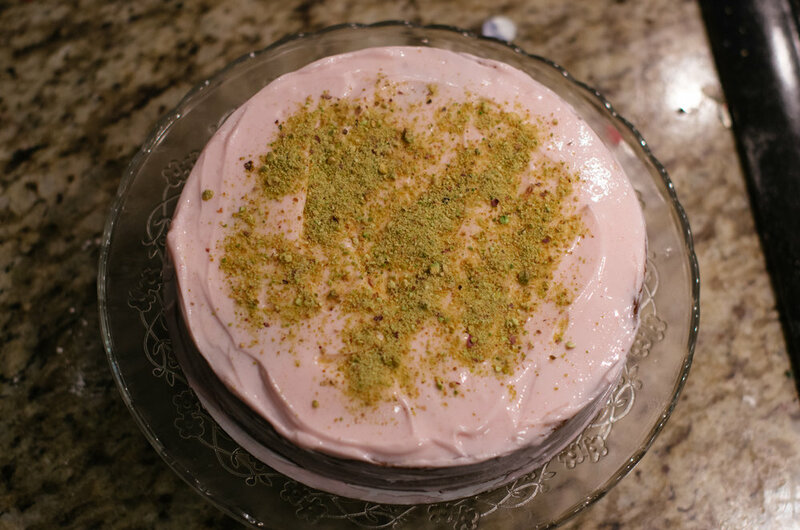 I’d love to try the full recipe again and see what happens. Cheesy Prosciutto Bread: I have no idea if it’s the recipe or if it’s somehow me, but Jesus christ this was peppery, like far too much black pepper than anyone has ever needed ever. I didn’t grind most of it fine enough because it takes one million years to grind even just one tablespoon of black pepper (I don’t own a spice grinder it’s fine I’m fine). When my mouth wasn’t full of pepper, this was delicious and I’d like to try it again, but yeah, the pepper…did a whole lot. Grits with Prosciutto & Gravy: I’d never made grits before, which is probably a major source of shame to my Louisiana family, but I’m also very glad my first time making them was for this recipe! I think my girlfriend said it best: “I am going to shove my entire face into this prosciutto, grits and gravy thing.” There’s really nothing else to be done. Spinach Salad with Prosciutto Vinaigrette & Egg Mimosa: Look, I don’t know how to photograph salad, and I don’t know how to make it either. I burned/charred (if we’re being generous) the prosciutto for the vinaigrette, and I didn’t boil the egg hard enough because I prefer runny yolks. I didn’t finish this. I’d like to try it again sometime, but maybe I’ll practice with a cheaper form of pork first. Egg Tagliolini with Prosciutto, Butter & Parmesan: So so so good. I’d never made fresh pasta from scratch, and I didn’t cut the noodles thin enough, but whatever, everything here was harmonious and delicious and I’m very excited to make it again. …I put an egg on it. Even better. In typical February fashion, my cooking didn’t go as planned and there was hardly enough time for what did. Earlier this year I decided to work toward a more plant-based, vegan-ish diet, and Yogurt was left in the dust, due to its inherent nature as a dairy product. I should have more to say, but I don’t. February has always felt like a transitory month. I’ve had a lot of headaches, real and logistical. I read a lot this month, and I cooked a lot this month, and I tried many new foods this month. That’s probably part of it: transition into a version of myself both more and less like who I was years ago. When I was 10, I could finish a book in a day, and I never dreamt of eating rice. I’m not sure what my motivation was. I was afraid of the possible texture, I think. Reading cookbooks has let me grow softer with my fears. 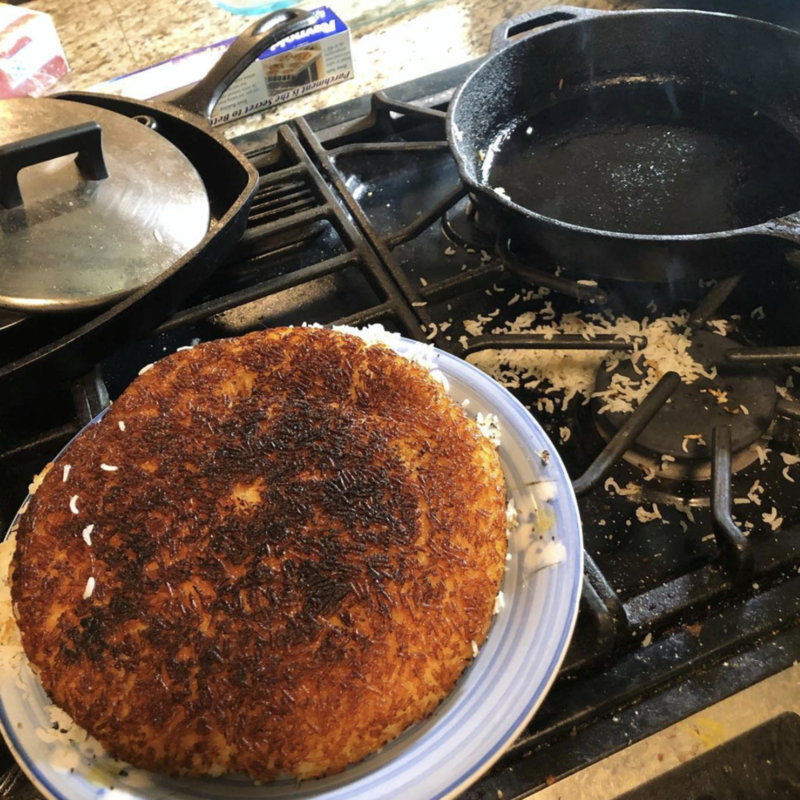 When Samin Nosrat described tahdig in her recipe for Persian-ish rice, I thought it sounded like something I’d like, and if I didn’t at least no one would be the wiser. So I made it, and it was delicious, of course. Finishing Salt, Fat, Acid, Heat helped me link my love of reading and my love of food in a way that other cookbooks really haven’t before. On an episode of Julia Turshen’s podcast, “Keep Calm and Cook On,” that featured Nosrat, the two discussed their backgrounds in poetry and literature and how that’s affected their approach to food. It was inspirational, and made sense; Turshen and Nosrat both write so lyrically. That’s what I want when I read about food. That’s what I’d like to work toward. It’s not that that’s missing from Yogurt, obviously. It’s just that, this month, it was harder to limit myself to just one core ingredient when there were so many other tastes waiting for me. Lazy B Mac & Cheese: I actually didn’t realize until just now that I only made this once this month, which really surprises me because it was so good. I’m not really a fan of traditional mac & cheese; I don’t like the texture of the macaroni, no matter how many times I try it. This version, with pearl couscous, was delicious. Yogurt Pita: I am going to make these again and again, I can sense it. My girlfriend was very upset when I wouldn’t let her eat the entire batch, though I think she’s glad I didn’t every time we toast one of the frozen ones to have with dinner. Cheddar, Za’atar & Kale Frittata: I love all three of the central ingredients in this frittata, but the frittata itself wasn’t my favorite. I’m still getting used to food that has onion front and center, and if I make this again, I’ll probably skip the yogurt topping; for me, it didn’t work well with the sweetness of the onion and scallions. Yogurt Egg Cream: Your eyes do not deceive you: that is not a yogurt egg cream, it’s Samin Nosrat’s Persian-ish rice, specifically the failure I made of trying to flip it. The yogurt egg cream itself was wonderful, but I forgot to photograph it.